Landing pages are phenomenal digital marketing tools. If you’re intelligent about how you handle them, they can repay you for time invested in no time at all. For the uninitiated, what exactly is a landing page? Just as the name implies, a landing page is a page that people land on to place an order, or request a service from your company. 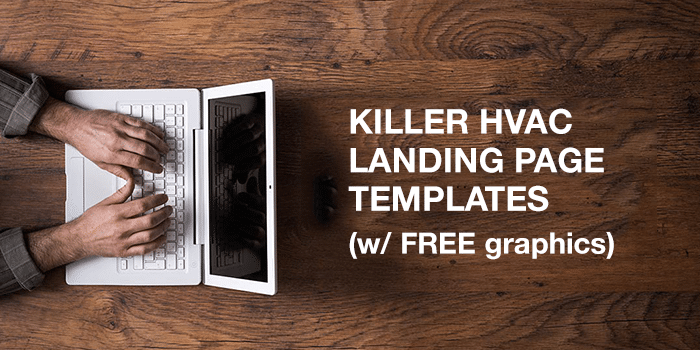 Landing pages offer a number of powerful advantages over the other forms of ads we’ve covered so far (email templates and social media design templates). First of all, they tend to be slightly more in-depth than emails and design templates. This gives us a chance to tell our prospects even more about the amazing value we’re offering. It also allows clients to submit their info to us quickly and easily, and request a free estimate at the click of a button. 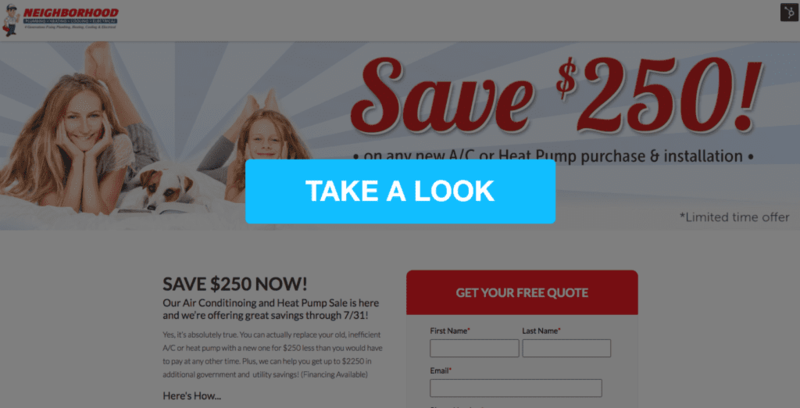 I’ve even made a complete HVAC Landing Page Template for you to base yours off of (using one of our prior promotions). While it’s true that landing pages offer unique benefits, we have to handle ourselves carefully here. Landing pages tend to be longer, and require action when the reader requests an estimate. With the somewhat lengthier format, we risk losing the prospect’s interest. Always remember, a bored prospect is a lost prospect. 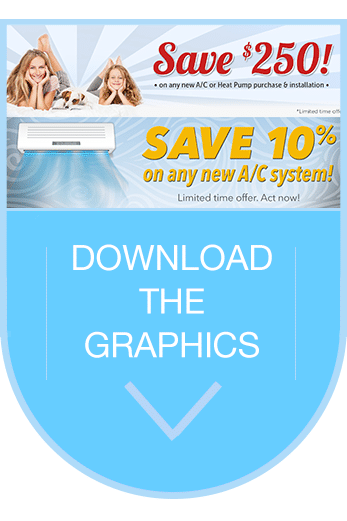 Don’t fill your page with anything that isn’t immediately relevant to your HVAC promotion. It’s equally important that we not be invasive when we ask for prospects’ information. For one thing, avoid “catcha’s” at all costs (the setting that requires users to enter a certain number of digits or letters, etc.). Also, avoid asking for intimate information, such as their address. You can get that later after they’ve hired you from your awesome page. People don’t want internet strangers knowing their intimate details. Know that and respect that. Lastly, try to restrict your information categories to the bare essentials necessary for them to get their quote. Name, phone number, best time to be reached, etc. Keep it simple, and you’ll get more hits. As you noticed in my sample landing page, I created a strong sense of urgency. I let them know that my promotion won’t not last forever. Whether yours lasts for one month or two, or even a few weeks, is entirely up to you. But whatever you do, make sure they know it won’t last. And hopefully this goes without saying, but make sure your promotion is well-written and grammatically correct. Poor grammar and writing look incredibly unprofessional. Your site is a direct reflection on you. I’m sure you noticed that at the bottom of my page, I gave my prospects one button, one option: convert and receive amazing service. Remember, this is a landing page. You want them to land on the page, and take advantage of your promotion. It wouldn’t make any sense to have another button, would it? Hopefully you have a better understanding of why a good Landing Page Web Design can be such an amazing marketing tool. You have a bit more space in which to convince prospects of your skill and value. But be careful not to bore them…a bored prospect is a lost prospect. Remember to make your copy compelling, and create a sense of urgency with an expiration date. They need to know this offer won’t last forever. Finally, I want this blog to benefit you personally (and immediately). That’s what this is all about, after all. So I’ve made the copy and the graphics for two landing page promotions available in a single downloadable file. Stay tuned for more digital marketing tactics, and I can’t wait to hear all your landing page success stories!